I had a very interesting walk/stroll this weekend. On Saturday morning, I walked across a familiar route – from Tower of London crossing Tower Bridge, down to London Bridge, walk through Southwark and then crossing the Millennium Bridge until I reached St. Pauls Cathedral. When I say familiar route, it means very, very familiar like it is my backyard or frontyard. I know what’s new and what has changed. But, last Saturday, the familiar became foreign. I discovered something on those bridges I crossed. I noticed padlocks hanging from the railings. There were only few in the whole stretch of the railings and unless you look closely, a tourist or a local will not notice it. When I got home, I immediately googled what these padlocks mean. I found one article from New York Daily news that says, “It is a romantic ritual birthed in Italy. The symbolic gesture of everlasting infatuation popped up in Rome about five years ago as locals started copying the lustful characters in Italian author Federico Moccia’s popular novel “Ho Voglia di Te”, or “I Want You” in Italian. The trend then spread to Paris and became noticeable on the Brooklyn border in 2010.” One tourist further said that it means locking your heart away and throwing the key into the river so it can’t be reopened. A friend recently asked the question of whether there is a guarantee that the deep and intense love one has with someone or something will last forever. How would I know? How would anybody know? Perhaps if there is really such a thing as locking your heart away, there will be a guarantee. 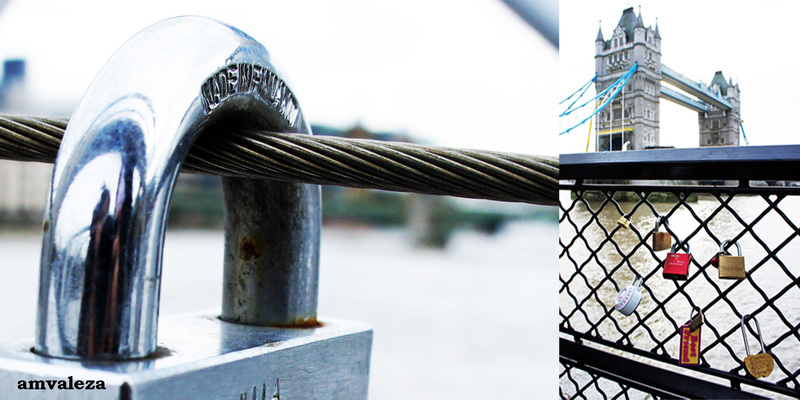 But no, our hearts are not as hard as steel like these padlocks are made of. The key to our real joy and freedom is not by locking our hearts away but by allowing it to beat freely and let it produce songs that has the lyrics of our souls. Padlock serves as protection from unwanted persons..as well as protection for persons entering danger zone. .People padlock their property to prevent thieves. People padlock their hearts to discourage others from entering so as not to fall into infidelity…etc.etc. Intense love. That’s why they ended up with this idea. Locking up the cared vow of the couple. Good enough.